I go through this dilemma every time Christmas or my kids birthdays rolls around. I want to buy them gifts that inspire imagination and creativity so they will spend less time vegging in front of the tv or other electronic devices. Problem is, we have a small budget, and a lot of those kind of toys (ahem, legos) are really expensive. 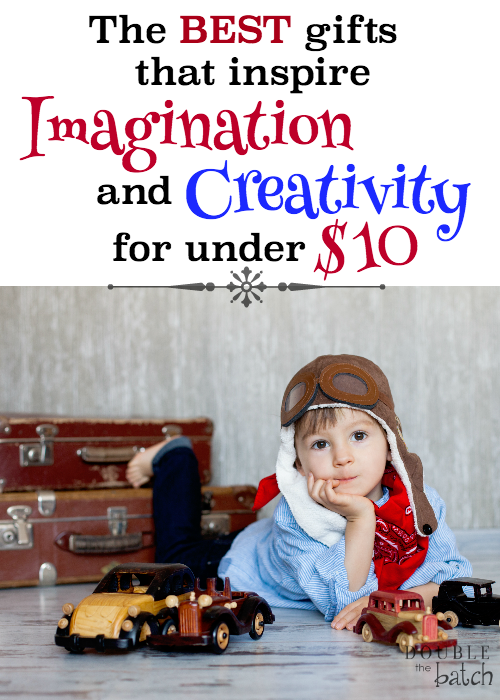 This year I went on a quest to find ideas for good quality gifts that were around $10 or less that I knew my kids would love. I hope what I found helps other moms who I know are looking for the same things. 1. What stage are they in? Baby, toddler, tween, etc. This will help narrow down the kinds of gifts your child may enjoy. 2. What are their talents, hobbies? 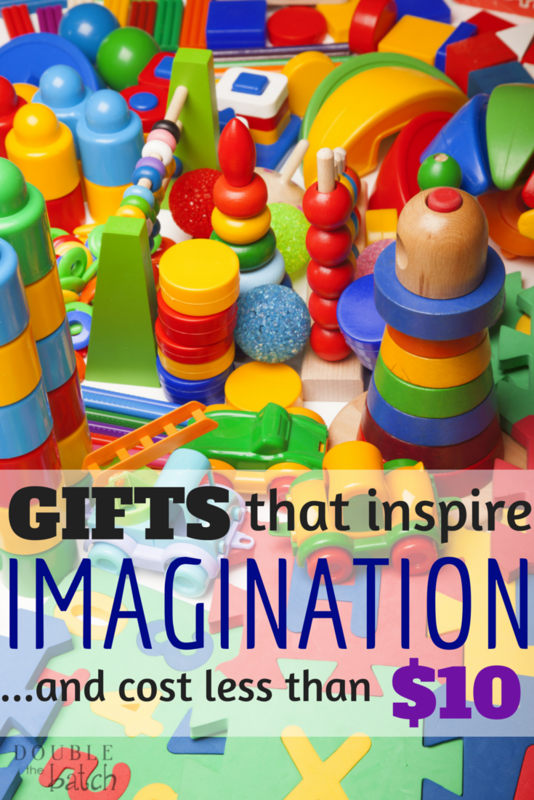 If you’re looking for gifts that inspire imagination and creativity, you’ll want to look for things that strengthen their individual talents and be FUN at the same time! I have 2 girls that LOVE arts and crafts and make believe event though they are 5 years apart in age. Both of my boys like cars, building, and coloring. (does coloring on the walls count?) Everything I am including in this post was inspired by my kids. I know they would LOVE all of these toys! I found a lot of gift ideas in my ‘quest’ and another thing I noticed was that most of my favorite finds came from 3 major companies. I will share those ideas first and then add in the other random gifts that I also found. 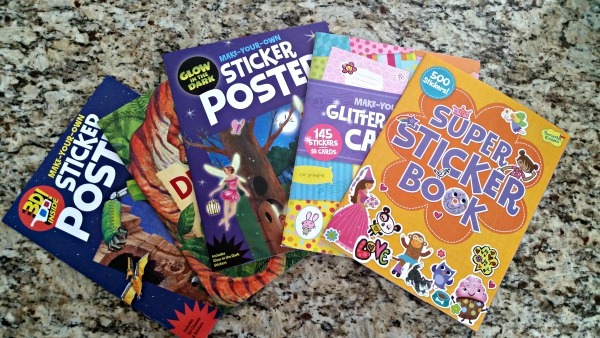 If your child loves stickers of ANY kind, look no further! I also love these little diaries with locks for boys and girls. It’s hard to find diaries for boys and I know my son will love one of these! 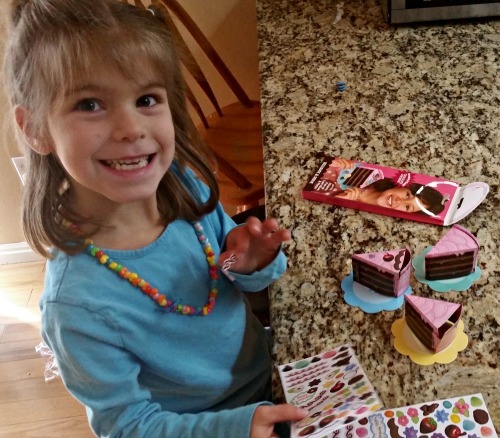 My 5 year old got so excited and was entertained all afternoon with this Make a Cake Party Sticker kit. You can check out all of Peaceable Kingdom’s awesome products on their website at peaceablekingdom.com or on Kiddlywinks.com or Amazon.com. 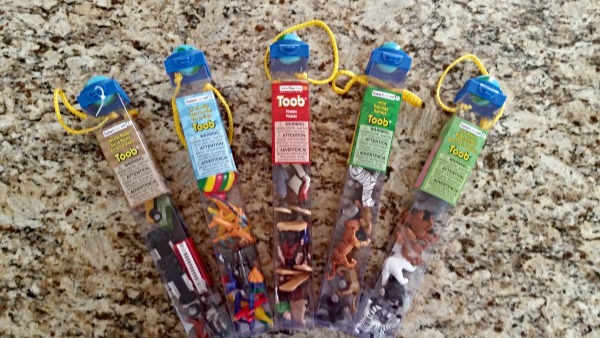 I have liked this company for several years now mainly for their line of product called “Toobs.” We’ve bought a few of these in the past and our kids really liked them so I was excited when Safari Ltd. sent us some more to review. These are great for stocking stuffers or for throwing in the diaper bag or purse to entertain kids on the go. We have even taken them to church. They have SO many different themes for their Toobs and you can get most of them on Amazon for about $10. Some cost less, some are a little more. 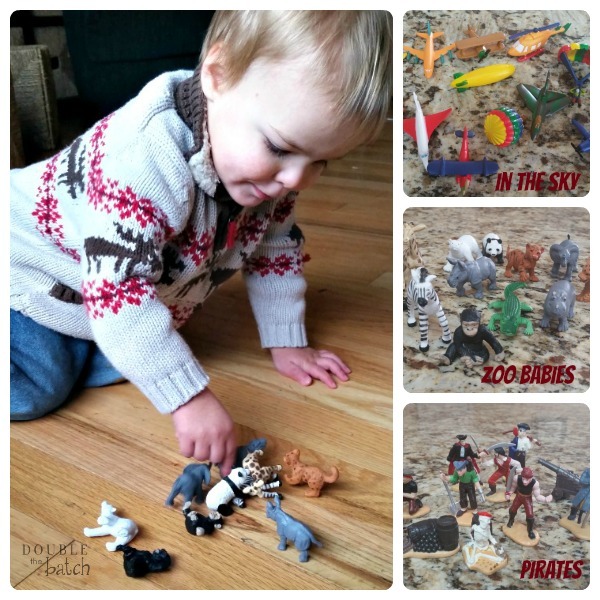 We have tried the Zoo Babies, In The Sky, Wild, On The Road, Pirates, and Knights and Dragons. My favorites so far are the Zoo Babies and Knights and Dragons Toob. They also have a HUGE selection of other toys and products that inspire imagination and creativity. Check them out at www.safariltd.com. We have used many of the Melissa and Doug products over the years and have always loved every one of them! My favorite part about their products….high quality for good prices and they all inspire imagination and creativity. I will only list some of our top favorites that are $10 or less. Puzzles. They have SO many! We have tried the Chunky puzzles, 12 piece jigsaw, 24 piece jigsaw, and 48 piece floor puzzles and love them all! I love that they are high quality and last a long time! Lace and Trace Cards. These have worked great for my toddlers and preschool age children. I like to throw them in the diaper bag for when we are away from home. Their Lacing beads are great too! Spill Proof Paint Cups. I have used these as a preschool teacher and they worked great and lasted forever! You can even fill them with your own homemade paint! Animal magnets. Tired of all the letter magnets on your fridge? Try these! Bead Sets. 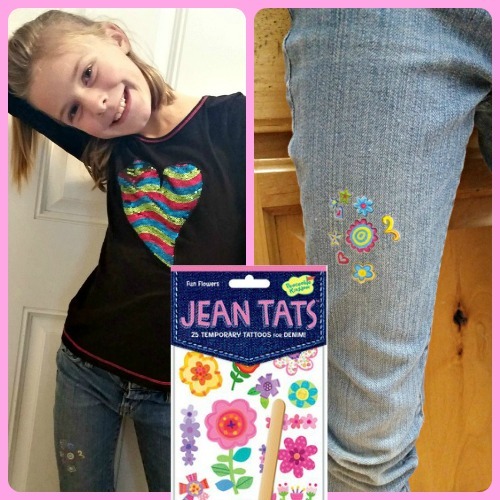 We have bought these for both of our girls and many other cousins and friends for gifts. They are always a hit! You can usually get a 2 pack for around $10! Scratch Art Magic. My older kids really love these. 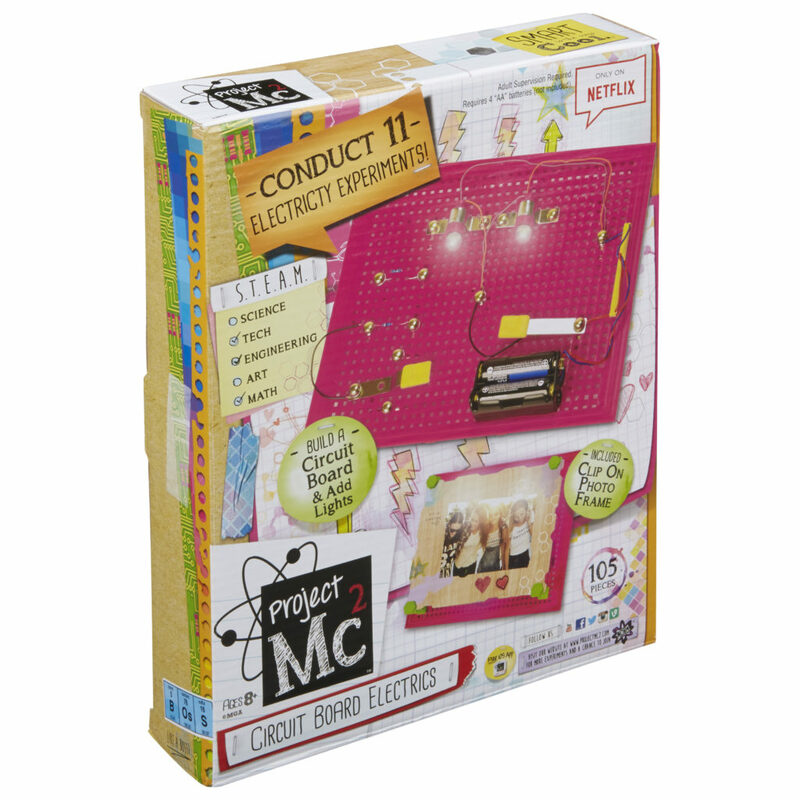 Project Mc2 Circuit Board Room Light. This is seriously genius. It will teach your child basic electronics with a circuit board, wires, battery box and more than 10 electricity experiments to try! Matching games (Most of these are $10 or less and come in a huge variety of most kids favorite cartoon characters. My favorite is the Curious George! Finger Puppets. These are always a hit with the younger kids. Once again, a great gift for on the go. Fingerpaints. These need no explanation! Stencils. I’ve also bought this one for my daughter 10 yr old for Christmas and she loved it. What other great gifts have you you stumbled across that are budget friendly?